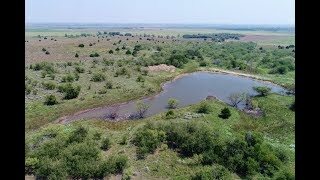 This 440 +/- acre ranch is located in Wilbarger County, Texas, approximately 12 miles north of Vernon and 1.5 miles west of the historic Doans community. It has county road frontage on its north, west and south sides, including the paved FM 2916, so it is easy to get to and around on. This ranch has been in the same family for over a century and is now being offered for sale for the first time. The land lays well with a gentle roll across it, consisting of sand hills and flat grass pastures. It changes in elevation approximately 90&apos; from north to south. Sitting along a soft ridge at 1350&apos;, it is one of the high points for the area before the countryside rolls down to the Red River, which runs just a few miles to the east. As such, the ranch provides some really nice views across the farms and ranches in the river valley bottom and on into Oklahoma. Approximately half of this land is in brushy native pasture, consisting of mature mesquites and hackberries. On the northeast side is a DENSELY wooded creek bottom, with 40&apos; tall towering elms, thick chinaberry groves, mulberries and willows. Game trails run all through this area, and it is perfect for bow hunting! The whole ranch has lots of bedding areas for whitetail deer across it, with all of its brush and tall grasses. Low range vegetation includes yucca, sage, ragweed and wild plum. Various grasses, such as tall bluestem, buffalo, side oats gramma, switch and coastal, provide grazing opportunities and wildlife cover. The main grass pasture, some 160 acres large, has scattered cedars and a few cottonwoods in it too. Electricity runs down the roads on both the north and south sides and is accessible. A large water tank is dammed up along a draw in the south central part of the ranch, which can hold approximately 1.6 surface acres of water when full. This tank has not been dry since 2013, at the peak of the multi-year North Texas drought. Before this it seemed to always hold water (see Google Earth timeline maps). The tank has trees and brush all around it, making it a good place to set up a deer blind. It attracts dove and migratory waterfowl in the fall and winter months, and provides a solid source of water for both wildlife and livestock. This ranch will have hunting for deer, turkey, feral hog and dove. When the bobwhites are on a good year, it will have excellent quail hunting too, as the native vegetation creates an ideal habitat for the birds. If you wanted to have a food plot, there is room in the middle of the property to till some of the bluestem pasture and install a 20 acre field. The soil type is Springer sandy fine loam, class 3e and capable of growing winter wheat or oats for staging deer, or you could plant it in milo or sunflowers for dove hunting. Bucks along the Red River valley can be harvested in the 140-160" B & C range, and every year trophies scoring higher than this come out of this county. The ranch is fenced and cross fenced with barbed wire fences, using metal t-posts. It has three grazing pastures, but the current ranching tenant runs cows across the land as one pasture. In the northeast pasture a 1700&apos; stretch of fence is gone between this property and the neighbor, so this pasture cant be utilized for grazing right now. All of the fencing is in good condition. Cattle are primarily watered through the water tank described above. A Red River Water Authority line comes in from the west side and a 20&apos; x 20&apos; concrete trough has been built off of this line with a floater valve, so you also have the option of watering cattle through it as well. A set of pipe working pens is located on the south side of the ranch. For annual grazing under normal rainfall, the ranch should be able to sustain 20 cow/calf pairs. It would work well for stockers during the growing months as well. The current tenant has been on the place for years and would continue to lease the ranch for grazing, if a new owner was interested. He is currently paying $8.80/acre on an annual basis for the lease. This place was part of the Great Western Trail, which was one of the main trails used to drive cattle in the 19th century from South Texas to Nebraska. Pioneered in 1874 by Captain John T. Lytle, it remained in use until 1893 when barbed wire fences and the railroad made it not feasible or economical to use anymore. The cattle crossing at the Red River, just a mile and a half east of this ranch, had a trading and supply store ran by Mr. C. E. Doans, and his adobe house, built in 1881, still stands there today. Every year in May, Wilbarger County hosts a picnic at the Doans house, commemorating the pioneers of Wilbarger County and history of the Great Western Trail. Trail markers and historic monuments are posted at Doans and in front of the ranch. Any owned mineral rights will be reserved by Seller at closing. There is one producing well on the far west side of the property. The oil company has an easement coming from the north side to get to this well, but rarely comes on the property as these minerals are pooled in with other surrounding properties. The ranch doesn&apos;t have any tank batteries or injection well sites, and the pump jack site is very clean. It appears there were two other wells near this well at one time, but they haven&apos;t been in operation in over a decade. For more information or see this great North Texas property, contact agent Benjamin Belew at cell phone (940) 357-9940.